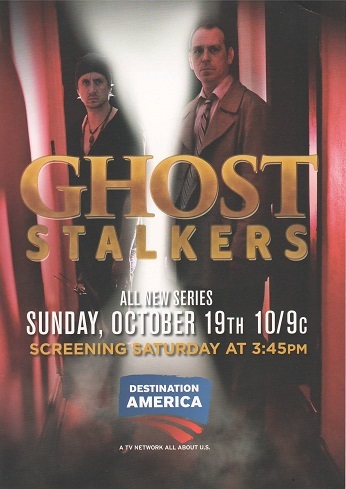 Word on the street is that Ghost Stalkers will not be returning on Destination America. The show, starring John E.L. Tenney and Chad Lindberg, was divisive. The cancellation by non-renewal was not for lack of effort. John and Chad reached out to their fans and held live twitter sessions for every episode. Others involved with the production followed suit. Unfortunately it was not enough to persuade Discovery Communications, owners of Destination America, to pick up Season 2. While neither John nor Nick Groff, Executive Producer, responded to instant messages seeking confirmation, their silence may in fact answered the question. While I enjoyed the show, I am aware that some people cringed at Chad’s zealous cries of fear. Looking beyond that, the show contained innovative equipment and technology designed to locate portals. John balanced out Chad’s excitability with insightful commentary. In addition, the locations were unique and not the same-old-same-old locations pervasive on other paranormal shows. I will miss Ghost Stalkers. Fingers crossed that one of Discovery Communications many other channels may be interested. Unfortunately, there is now another problem, with the controversy of the Stolen Valor allegations against David Rountree who created most of that technology for Ghost Stalkers. There is also questions about Mr. Rountree’s education claims. Whether true or not, it’s still out there being talked about. Still love Nick, John and Chad and look forward to their future ventures!! It’s an interesting twist that is still developing. I’m pre-writing a blog on this topic. Hope not true. I didn’t deny comment. Only now getting to them. I’ll look into. Hate to be hacked. There was a time lag, I think. My comment showed up later and it would be understandable to take down the one where I questioned it. You’re blogs are always well written and I’ve always found comments allowed and unedited, which is greatly appreciated! Thank you for your continued great work and interesting subjects! I thought there might have been a time lag. Admittedly, I have denied some comments. They were from one person using fake email addresses. Thanks for participating in the dialog! Very much appreciated. Unfortunately, there is also a problem with the allegations of David Rountree and Stolen Valor, along with problems with what he has claimed as far as his education. Whatever happens, I wish Nick, John and Chad well and look forward to their future projects! I think the fact that the show was based on two guys facing the hauntings each alone and then discussed it between themselves. I honestly didn’t think it was going to last as long as it did. Show aside I love Nick! He’s extremely talented and a he seems to think before he acts which would explain his success in whatever he does. He seems extremely positive and forward thing. l think he should sell his “Tour” films to the highest bidder! He deserves a show of his own with his own ghost hunting crew. He does it all! He finds the spirits, comunicates with them and finally asks them if they need help! I have been waiting so long to see a ghost hunter do that, actually do more than use spirits for a paycheck! He has always had more class than Zack, just look at how Zack talks to people on national television. If he’s that bad edited imagine what he’s like when the camera is off! I hope Nick’s next venture, no matter what it is, gives him the audience and praise he deserves. Good luck! Most of the people I know who investigate ask the clients, “How can we help?” This seems to be missing in most of the TV shows. That simple question says it all. Grant Wilson used to ask it on Ghost Hunters. Thanks for sharing! I have about eighty channels, but sadly DA wasn’t one of them, so I was never able to see it. I’m surprised how Discovery Communications, parent of Destination America, limited the channel in certain markets. The episodes were on YouTube; however, I don’t know if they are still up. One day you may catch it on another channel.